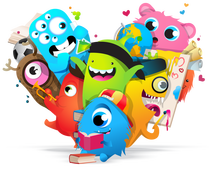 Class Dojo is an online program I utilize which strengthens student learning habits and boosts classroom engagement. Students earn positive points for classroom behaviors (participation, following directions, etc.). Students monitor their progress throughout the day and parents can monitor progress in real time on a tablet or smartphone device. Classroom newsletters are sent weekly through Class Dojo. ​Go Noodle is an engaging website I use where students choose an avatar and watch it "grow" through various classroom exercises. Maximo's stretches are used to start our day and stretch the sillies out. These stretches increase student focus for the remainder of the day. Our day ends with choosing a fun, appropriate brain break song which gets student's moving and grooving!